The 2nd Expert Metting of Task 62 will take place in Almería, Spain from April 2nd to 3rd, 2019. Isabel Oller, Subtask B leader and Head of the Solar Treatment of Water Unit at CIEMAT-Plataforma Solar de Almería will welcome as in Almería. The aim of the meeting will be to present the general issue of Task 62, the highlights of our work so far and discuss and work out potential contribution and collaboration of all participants for Task 62. All participants have the option to give a short presentation (approx. 10 min) to present their ongoing work and project related to Task 62. 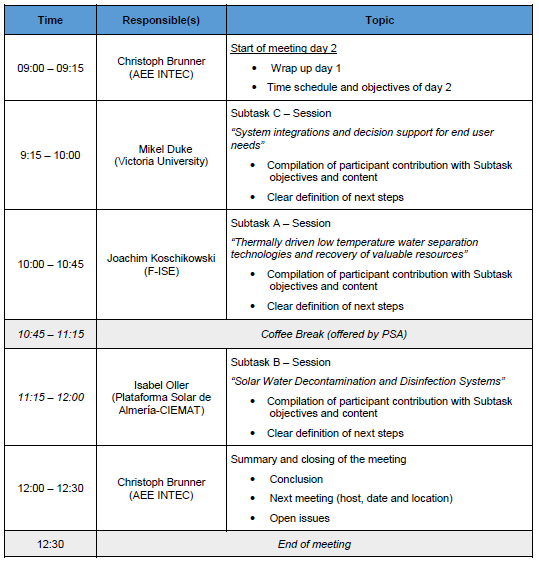 Furthermore, the Subtask leaders of Subtask A, B and C will give an overview of the objectives and define the steps for the next period considering the participants contribution. If you would like to join the meeting, please contact Anna Grubbauer (a.grubbauer@aee.at). 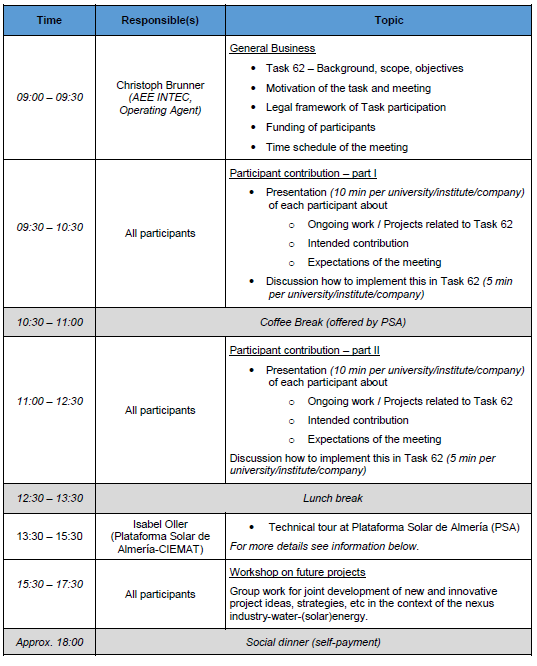 The meeting will be held in Almería at CIEMAT-Plataforma Solar de Almería starting on Tuesday, 2nd of April at 09:00 and will end on Wednesday, 3rd of April at 12:30.